Since its release in 2008, Let the Right One In has received its far share of acclaim, especially from genre enthusiasts who cite it as one of the defining vampire movies of recent years, if not of all time. A dark, brooding drama, the premise – 12-year old boy befriends and possibly falls-for the blood-thirsty girl next door – sounds a little like another popular vampire tale, but there’s not a sparkling vampire or pining adolescent in sight. The film is based on the book by John Ajvide Lindqvist (who also wrote the screenplay), and features two extraordinarily performances from its young lead actors, Kare Hedebrant (as the boy Oscar), and Lina Leandersson as his mysterious neighbour, Eli. Leandersson, especially, has such a powerful presence with her slightly androgynous, otherworldly features and incredible gleaming blue eyes. For Oscar – bullied at school and trapped in the bleak Stockholm winter of 1981 – the burgeoning relationship between he and Eli is an escape from the isolation and loneliness of his existence. For Eli, the reasons may be a bit more complicated. There are other characters, such as Eli’s surrogate caretaker Hakan (Per Ragnar), and a group of locals stirring off the cold with alcohol, but the film is primarily a dark fairy-tale about these two oddly matched individuals. Let the Right One In is shot by director Tomas Alfredson with an eerie stillness; he’ll hold a frame for an inordinate amount of time, and makes hugely effective use of slow rack-focus. Everything, from the diffuse cinematography to the pace of storytelling, is deliberate, and the whole thing hums with an eerie menace. It’s tough to choose between this Swedish original and Matt Reeves’ 2010 American remake (Let Me In), which is not as subtle but equally as effective. For me, it’s Let Me In by a hair because I feel more in touch with Reeves’ dark Spielbergian sensibilities. But that doesn’t stop Let the Right One from being a beautiful, evocative piece of cinema. 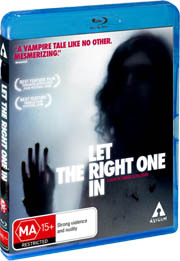 Perhaps Lindqvist put it best when he said: “Let the Right One In is a great Swedish movie. Let Me In is a great American movie.” Both are very much worth your time. From the melancholic snow fall that backgrounds the disc menu, you can tell this release is quality. The film is presented in clean 1080P, 16x9, which does justice to Alfredson’s elegant widescreen compositions and cold colour palette. Some scenes are deliberately not as sharp as they could be – Alfredson and Cinematographer Hoyte van Hoytema used diffuse lighting (in a technique they called “spray light”) to add to the still atmosphere – and that effect is nicely preserved by the transfer. Audio is 5.1 DTS in the original Swedish or, if you have no shame, a pointless and mood-killing English 5.1 dub. Slim on the ground, with only the theatrical trailer and 15 mins of deleted scenes.